The apocalypse has been and gone, leaving behind a pink-hued world for you to explore in Far Cry New Dawn. For the first time ever, Ubisoft has created a direct sequel to a Far Cry game, taking players to Hope County after the nuclear bombs dropped at the end of Far Cry 5, although many years have passed. That means you’ll be taking on new threats with makeshift weapons, exploring an unrecognisable version of Far Cry 5’s map when you’re not murdering folk. There are also some destruction derby-style races to be had in the post-apocalypse. Far Cry has always been as much about the antagonists as it is about the world and the lead character. In Far Cry New Dawn, the big pantomime threat comes from a pair of raider twins, by the looks of it. 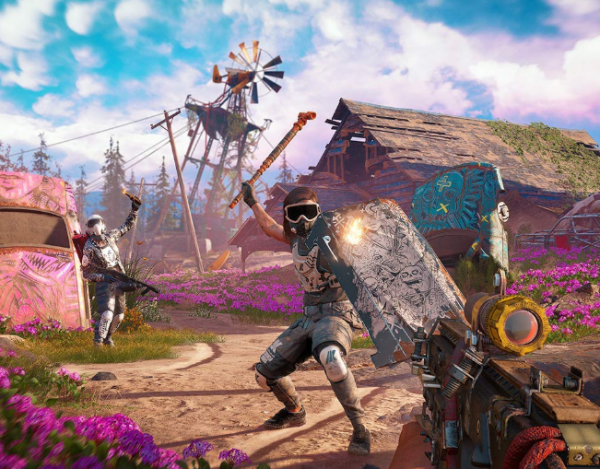 Far Cry New Dawn releases on February 15 for PC, PS4, and Xbox One. The shooter was revealed at the Game Awards 2018 – click that link to watch the show as it happens and in 4K.